Yesterday I had the opportunity to attend a day geared towards the mentoring of teachers that have been newly hired into the Toronto District School Board. The aim of this day is to encourage the new teachers and to give them guidance as they prepare to begin the school year in September. Words of encouragement were given by the Director, Donna Quan. A guest speaker spoke words of inspiration around the theme of the morning: parental involvement in a child’s education. Lunch was organised with the superintendents of the various school districts and I met a person I would see in the school corridors from time to time. Sessions were run geared towards the grade level of the teaching assignments. 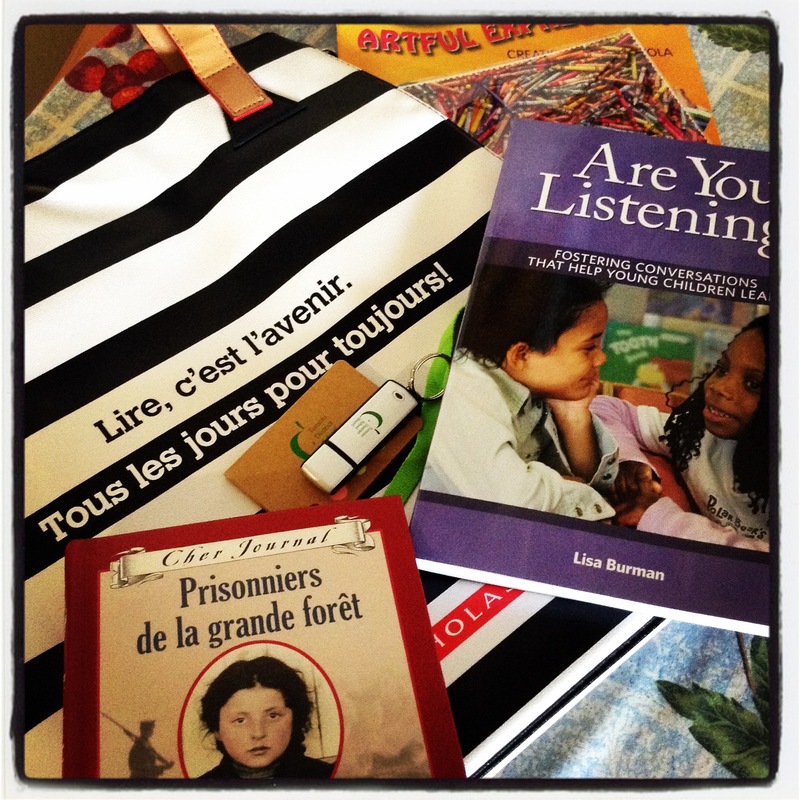 I, of course, attended the sessions on Kindergarten in French Immersion. I am grateful for days such as these and have benefited from the ones I have attended in the past. Tips are given by the facilitators that are helpful in the first few weeks of school. Connections are made with other teachers. Ideas and concerns are shared. Assurances are received. Often the day ends with a small gift from the organisers. Yesterday I came home with a USB key (always helpful during the school year), a booklet on suggested art activities and a gift bag filled with catalogues, CDs and a book from Scholastics. My favourite gift, though, is the one handed out after the session with the Kindergarten facilitators: a book titled Are you listening? by Lisa Burman. I look forward to reading what she says about encouraging conversations with young ones. I have come to realize over the years that listening to someone is the best gift – brilliant post. Thank you Julie. I came home yesterday feeling that I had learnt something; and feeling the first day jitters have eased a little. I’m happy that the TDSB still does this. When I first started teaching these sessions didn’t exist. Luckily I had a great mentor and we quickly became best friends and have continued to be so some 38 years later. This is a relatively new thing that has been started by Donna Quan. She believes a lot in supporting the teachers and this is one of the ways in which it is done. In addition to these sessions, we do have a mentor that helps us with the daily business of the classroom. I have soooo much to be grateful for this week: my daughter’s knee is healing quickly, my mother’s neck pain is improving, my arm pain is improving, I have a new contract so it’s a continual answer to a prayer in having the blessing to work from home and raise my child, we are healthy, we are happy, we have food on the table, clothes on our back, a roof over our heads, a car that runs, a wonderful school Hallie is blessed with and we are blessed her dad pays for half the tuition. What blessings you have received this past week Carol. It is wonderful that your loved ones are healing and that you have a new contract for work. As we count our blessings, we can only be open to receiving even more. Thank you for sharing all that you are grateful for – and may your next week be just as blessed. And yet they are so important aren’t they Sonel? In the past two years I have had wonderful people help me prepare for my classes. I hope to one day return the favour. Sounds like a great program for supporting teachers, Colline. I believe it is Amy. It is helping a lot of new teachers adjust to working in the classrooms. Thant is the best way to feel, isn’t it? You become aware of so many little things in your life. I’m grateful for good health. I hope you enjoy your book – ‘Are You Listening?’ Lots of people think they listen but they don’t. Really listening takes effort and openness. I hope so too. I will begin it when I have finished reading the Maeve Binchy I found in the library this week. Fab post Colline! Mentoring is such a selfless gift, and I am always grateful for a wise mentor – it is often invaluable! As a manager of a mental health support team, I always do my best to provide inspiration to others. There is nothing more ‘feel good’ and rewarding (aside from a lottery win of course, :D) than helping others build confidence and skills. I am always grateful for mentors Amanda as they are often so selfless with their help . Your entry for this week is beautiful. Butterflies are always such a delight to see. A beautiful mentoring tradition Colline. A tradition that is beneficial in assimilation and acceptance. Thank you Ian. Sometimes we forget to be grateful for what we have in our lives. My weekly post is an acknowledgement of what I have to be grateful for.